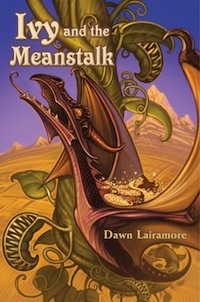 Fourteen-year-old Princess Ivy is an intrepid sort, so when an enormous beanstalk erupts out of the castle grounds, she and her dragon buddy Elridge fly to the top to get to the bottom of it. There they discover an enraged – and exhausted – giantess. Ever since a kid named Jack stole her magic harp – and killed her husband – hundreds of years ago, she hasn’t been able to get a wink of sleep. Ivy and Elridge must hurry to the kingdom of Jackopia to retrieve the harp before the giantess wreaks her vengeance – but the king of Jackopia is none too keen to give up his ancestor’s treasures.